The horse is eating from the table on the terrace of Ludwig’s hunting lodge Königshaus at Linderhof, near Munich. He tumbled a glass and a vase with flowers and quietly eats an apple from a dish. Between 1867 and 1880 Wilhelm Pfeiffer made 26 portraits of riding horses of King Ludwig, all with a different topographical background in the Munich area. This portrait shows a special situation: the horse has left its field, entered the garden and found something to its liking on the terrace. Tradition says that Ludwig himself had Cosa-Rara led to the table to watch its behavior. 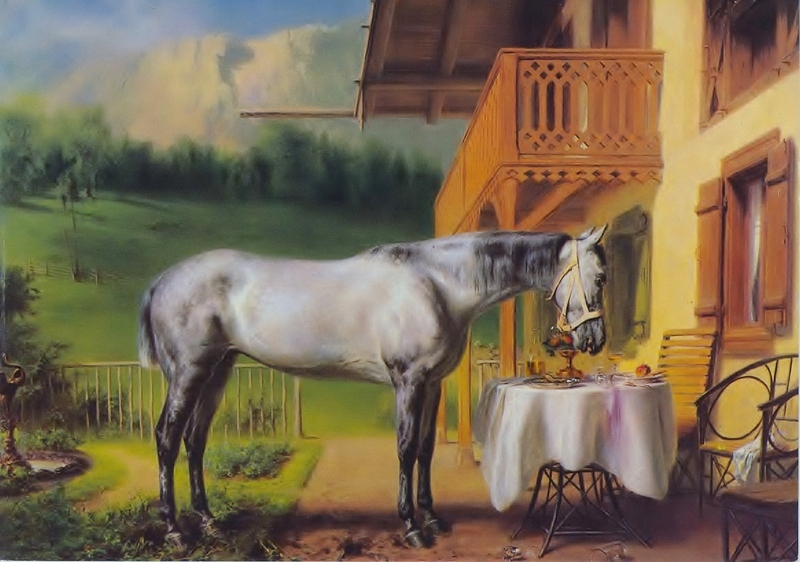 All 25 other horse portraits show regular posing situations, but for this horse the painter used the special situation which had really happened. Most of the riding horses of Ludwig II were English thoroughbreds.